Queen’s Plate winner Lexie Lou made a smooth transition to the turf Sunday at Woodbine with a decisive score in the $250,000 Wonder Where Stakes, the final leg of the Canadian Triple Tiara. 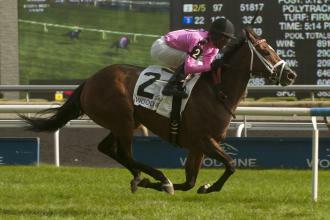 Lexie Lou made the transition to turf just fine Sunday with a victory in the Wonder Where Stakes at Woodbine. Lexie Lou ($2.90) was boxed in along the inside behind the leaders until the top of the lane in the 10-furlong test for Canadian-bred 3-year-old fillies. Patrick Husbands angled her wide for the stretch run, and she collared pacemaker Skylander Girl around the three-sixteenths pole before drawing off for a three-length victory in a quick 2:00.90 over the firm ground. Skylander Girl finished 6 1/2 lengths clear of Lapsang, who edged out Llanarmon for third. The latter was disqualified and placed seventh for interfering with Regal Conqueror in the stretch. The Wonder Where was the fourth winner on the card for trainer Mark Casse and the second for Husbands. Earlier, they combined to take the Grade 2 Play the King with Kaigun, who’s owned in part by Barber. Lexie Lou has established herself as the leading candidate for Canadian Horse of the Year honors. Owner Gary Barber, who purchased her privately in the spring from owner-trainer John Ross, said she’ll probably make her next start on turf. “Patrick said she’s 20 lengths better on the turf,” Barber said.